It seems somewhat odd that the Doctor with by far the shortest amount of screen time has had the greatest amount of non-televised work dedicated to him. Undoubtedly due purely to the fact that the television movie left the Eighth Doctor as a completely blank canvas full of untapped potential that could never become stale due to continuity constraints, the number of written, comic, and audio adventures dedicated to this regeneration is staggering. With ‘The Company of Friends,’ Big Finish brings those three distinct interpretations of the Eighth Doctor together, framed within the context of travels with just a few of his many companions. It’s certainly a bold move for Big Finish to dip its toes further into the expanded universe territory, but it’s also a move that will be sure to appease long-time Eighth Doctor fans while introducing Big Finish fans to alternative interpretations and travels of Paul McGann’s iteration. Of course, the brevity of each story allows only the briefest glimmer of the Doctor-companion relationship, but the sense of nostalgia obtained is a testament to Big Finish as a whole. Intriguingly, the first story features Professor Bernice Summerfield, one-time companion of the Seventh Doctor but who also crossed paths with the Eighth Doctor in his sole The New Adventures novel The Dying Days. While the ending of that story is alluded to briefly in the opening moments, the Doctor interestingly takes a bit of time to remember who exactly Bernice is. This does to serve to undermine the ‘friend’ aspect of the title in regards to the Eighth Doctor, but once events get going there is an easy chemistry between Paul McGann and Lisa Bowerman that shines through, and the script perfectly includes the banter and quips for which Summerfield is known. While the plot itself is fairly generic as they try to keep the TARDIS from falling into the wrong hands, the resolution is rather unique even if it does require some lengthy explanation for the time aspect involved to hold. Perhaps the highlight of the piece, however, is Bernice’s comparison between the motivations and actions of the Seventh and Eighth incarnations, a nice nod to the bridge that she creates between the two. It may not be ground-breaking drama, but it does allow two of Big Finish’s stalwarts to cross paths, resulting in a welcoming opening that is both fresh and familiar at the same time. Stephen Cole, creator of companion Fitz Kreiner during his tenure as editor of the Eighth Doctor BBC novels, is tasked with bringing the incredibly engaging character to life for the audio medium in the second story. Over the course of forty-plus novels, the Eighth Doctor and Fitz developed a mutual affection for each other not unlike the Second Doctor and Jamie. Unfortunately, despite the incredibly harrowing events these two characters have been through together, it’s simply impossible to expect Matt di Angelo and Paul McGann to instantly have that sort of repartee and comradeship when only interacting for this one story. Fitz is an incredibly layered character, and di Angelo certainly does his best, but there is a slight disconnect which can naturally be expected when making the jump from page to audio. Still, the story itself that features the Doctor being involuntarily used as a means of corporate publicity is very unique and blends humour with drama wonderfully. Izzy is the featured companion of the third story, her creator Alan Barnes asked to transition her from the comic pages of Doctor Who Magazine to audio. This is arguably the strongest story of ‘The Company of Friends,’ blending the two mediums together fantastically as Doctor Who riffs on the British comics industry in general. Jemima Rooper is perfectly cast as Izzy, bringing the quirky vivaciousness to life while striking an instantly amiable relationship with McGann, and the spectacular performances and sound design help realize the rather surreal nature of this release effortlessly. The final story is quite a unique one because, rather than focusing on another of the Eighth Doctor’s known companions, it instead focuses on Mary Shelley whom the Doctor briefly mentioned in his first Big Finish audio ‘Storm Warning.’ While it’s perhaps unsurprising that the Doctor and the concept of Doctor Frankenstein and his monster are in a way related to each other, the script does a marvelous job in subverting expectations partway through as it shifts away from simply retelling the famous horror tale. Julie Cox is very entertaining as Shelley and, though the Doctor’s interactions with Byron are over a bit too quickly, her performance alongside McGann certainly whets the appetite for further adventures with these two together. Considering how short each story is, all four do a surprisingly good job in capturing the tone of their eras and their own Eighth Doctor in his relative timeline. 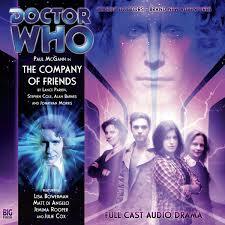 ‘The Company of Friends’ doesn’t set out to change the overall mythology of Doctor Who, but it succeeds wonderfully in offering nostalgic entertainment in a more light-hearted tone than many of Big Finish’s releases, a definite highlight worthy of a listen.